WWI Profile: Albert Warren Williams 1894-1985; Henry David Williams 1892-1972 | Friends of Fort Caswell Rifle Range, Inc. Submitted by Harry David Williams’ grandson. Albert and Henry Williams were brothers born and raised in Shallotte, NC. A partial family tree is located in FamilySearch. Albert was 22 in 1917 when the country entered WWI. Henry was 25. Albert’s WWI Draft Registration form shows he was single and a farmer. Henry was a widower, having lost his wife and infant a year earlier. He was also a farmer. 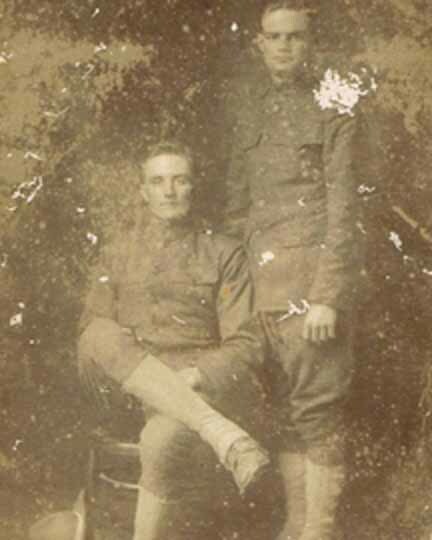 After receiving orders to report to the military board (Albert received orders for September 18, 1917; Henry for October 5, 1917), Albert and Henry were assigned to Company M, 119th Infantry, 30th “Old Hickory” Division. Refer to the previous posts outlining the history of the division and their famous Hindenburg Line assault. Henry was not injured during his service. He was promoted to Private First Class on June 1, 1918; then to Corporal on October 15, 1918. Pvt Albert Williams was wounded in the push after the September 29th Hindenburg assault, as the Allies continued their advance, capturing French cities and liberating the citizens. Using the map and description of the advance during October 8-10, detailed in the previous post, it is possible to pinpoint the approximate location where Albert was severely wounded on October 10, 1918. Page 59 shows that during the period of time when Albert was wounded, the following casualties were reported by the 119th Infantry. No sources were found that describe his injury. Pvt Albert Williams returned to duty November 11, 1918. The war ended that day. Albert was promoted to Private First Class on January 1, 1918. When Albert and Henry returned aboard the USS Huron on March 21, 1919, [source: ancestry.com] the passenger list described all as “Class A” which means fully fit. Both Pfc Albert Williams and Cpl Henry Williams were honorably discharged from the US Army on April 7, 1919. The 1920 census for Henry showed a familiar name. Henry was in New Hanover County, boarding with Harry Chadwick and his wife. (Harry Chadwick was the twin brother of Harvey Chadwick, who was Killed in Action in 1918.) Henry and Harry were working together as ship carpenters. (Henry’s first wife was the sister of Harry’s wife.) A 1920 census for Albert was not found, but he was married around the time of the census. Albert married in March 1920. Henry was married in November. Both raised families in the area. Henry passed away on December 8, 1972, at age 80. He was laid to rest in Gurganus Cemetery. No military honors are shown in findagrave. No obituary is available. Albert passed away on August 2, 1985, at age 90. His obituary was published in the August 8, 1985 issue of Brunswick Beacon. Albert Warren Williams, 90, of Hubert and formerly of Shallotte Point, died Friday in the Veterans Hospital in Fayetteville. The funeral was held Monday at Village Point United Methodist Church, with burial in the Gurganus Cemetery, Shallotte Point. Williams was a veteran of World War I, serving in the U.S. Army. He was a member of the American Legion and lifetime member of Village Point United Methodist Church. Williams was also a past chairman of the church board. He was the husband of the late Stella Lee Williams and the son of the late John L. and Susan Gurganus Williams. Survivors include a daughter, Mrs. Vivian Milligan, of Hubert; five grandchildren; nine great-grandchildren and one great-great-grandchild. Albert Warren Williams was also laid to rest in Gurganus Cemetery in Shallotte. Military honors are shown.